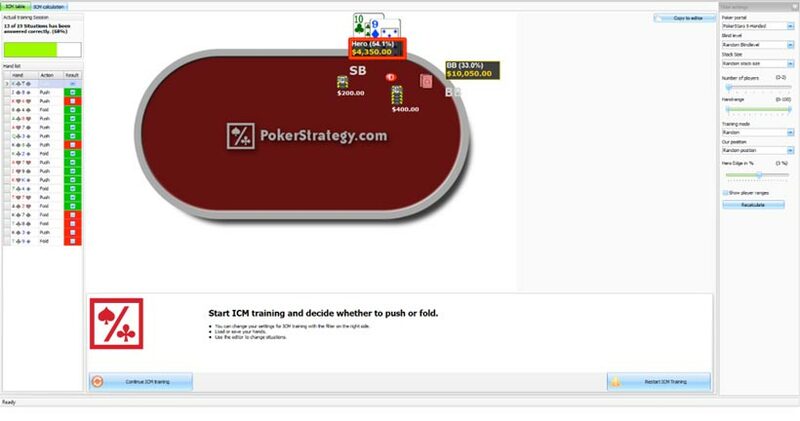 Our ICM Trainer review covers everything you need to know to use the software effectively and improve your tournament play - start improving today! There are two versions of this software, ICM Trainer and ICM Trainer Light. They are designed specifically for tournament or sit and go players looking to boost their edge. Today we'll do a full ICM Trainer review of both versions to help you decide which software is best for you. ICM stands for “independent chip model”. It describes the procedure of assigning a specific monetary value to our chip-stack by taking into account the tournament payouts and the remaining stacks of our opponents. Even the best tournament players in the World - guys like Phil Ivey and Daniel Negreanu - use ICM during every tournament they play. There are essentially two main features to the ICM trainer. The first is a training mode that help us with push/fold decisions. 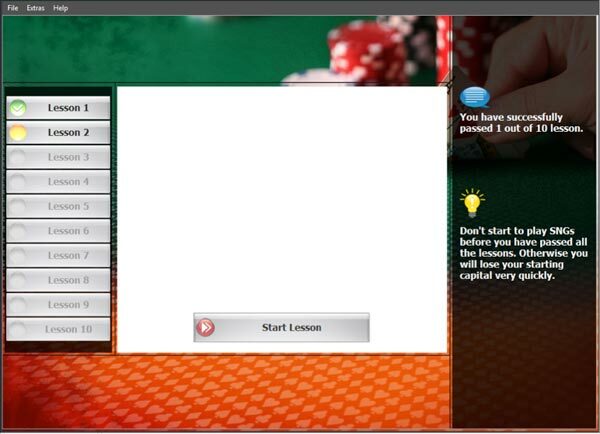 Users are presented with a series of scenarios where they must make a decision regarding the best play. This is actually a lot of fun and helps to develop an intuitive idea regarding correct push/fold ranges in the later stages of tournaments. The downside is that no pointers are given regarding calculation, and there is no explanation on how ICM calculations actually work. It probably helps to have a rough idea regarding ICM push/fold ranges beforehand. In the top left a tally of our ICM trainer results are displayed. The second feature of this software is an ICM calculator. 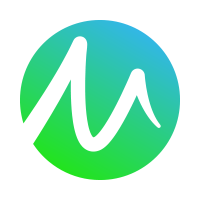 It will automatically calculate recommended calling, shoving and overcalling ranges. It also has the option to adjust these ranges based on any edge we think that we have over our opponents. In order to calculate the monetary value of our stack it is important to know exactly what the payout structure of a tournament is. 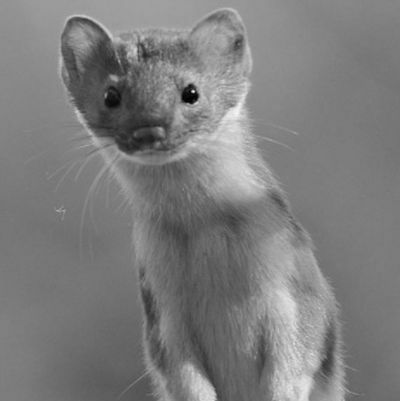 The closer a tournament structure is to a winner-takes-all structure, the closer our $EV will be to our chip-EV. Calculations like this are important for any casino games such as poker. This means that depending on the payout structure of the tournament, our push/fold ranges may vary dramatically. A good ICM calculator should therefore allow us to specify the prize pool distribution exactly. ICM trainer does not have this option. 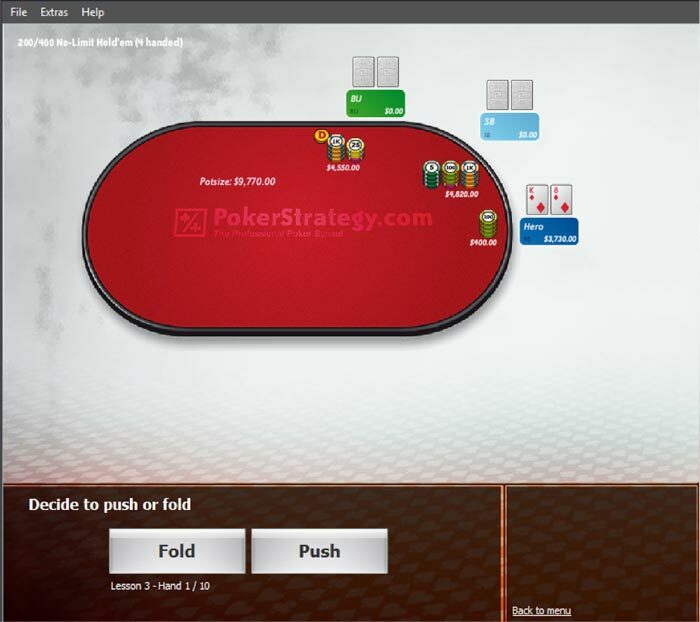 Instead users are forced to pick from a selection of pre-decided payout structures which are based around the formats offered by popular poker sites. This is unfortunate for at least 2 reasons. What could be a very versatile and highly useful ICM calculator now has very limited application. It has clearly been designed for STT SnGs only. It will be impossible to run ICM calculations for the prize structure in a larger field tournament or an unorthodox prize structure on one of the unlisted networks. To anyone who knows anything about ICM, it’s pretty confusing at first. Why wouldn’t there be an option to specify prize payouts when this is a requirement to calculate $EV? How exactly is the ICM trainer calculating $EV without this information? 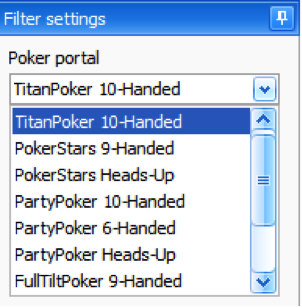 It takes a little while to realise that the “Poker Portal” options are linked to specific prize pool payouts. It’s not clear exactly what these prize pool payouts are however. ICM trainer almost feels like a different piece of software, given that the graphics have been souped up a little. It features just an ICM trainer and doesn’t contain the ICM calculator. 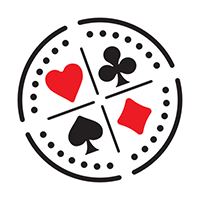 The objective of the software is clearly to get players up to an OK standard for late-stage SnG play as quickly as possible. 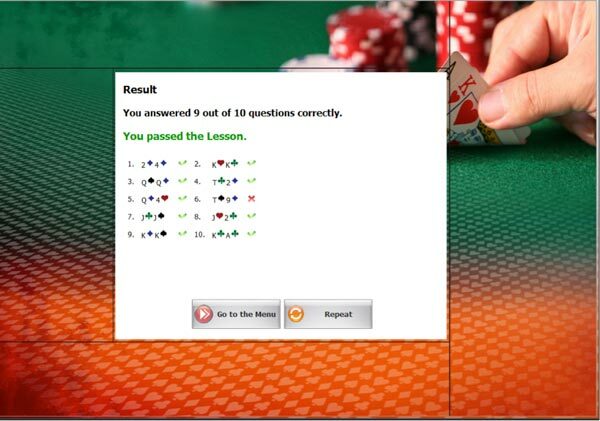 The method for doing this is a series of 10 lessons where users are presented with different push/fold scenarios. If the user gets enough of the questions correct, the next lesson will be unlocked. There are a couple of main differences between this particular simulation and the simulation that runs in the original ICM trainer. The ICM trainer light produces preset scenarios which increase in difficulty as the lessons progress. So if we did lesson 1 twice, we’d see the exact same 10 situations both times. The only difference is that ICM light will play around with the order that the scenarios appear. What would you do? Push or Fold? The hand simulation part of the ICM trainers are recommended and actually a lot of fun even if we are not a big SnG player. The ICM calculation side of things leaves a little to be desired since it is not as flexible as it should be and the options are highly limited. So if we give the simulators 8 out of 10 and we give the ICM calculator 4 out of 10, presumably that gives the software an overall rating of roughly 6/10. 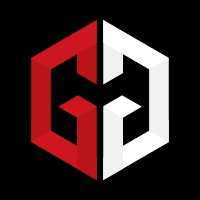 It’s definitely worth checking out, but serious or professional SnG players will need to upgrade to stronger software at some point. 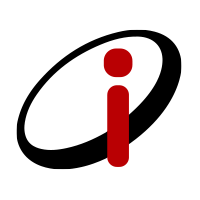 Hopefully this ICM Trainer review has been helpful in your decision of ICM software.